Giveaway: ZYEN-BXXY7690hui41 Women’s Comfort Mesh Walking Shoes Casual… | FreebieOrBust Freebies! Are you feeling lucky? Join Amazon Giveaways for access to the best sweepstakes deals available online. 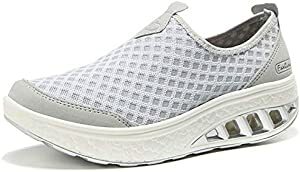 ZYEN-BXXY7690hui41 Women’s Comfort Mesh Walking Shoes Casual Platform Slip On Rocker Bottom Sneakers Light Grey 9 B(M) US. Chance of winning: 1:1000. There will be 1 winners. Offer hosted by Amazon and ZYEN Global Shop. We wish you the best of luck in your sweepstakes entry. Everyone loves freebies! Join our sweepstakes community and keep checking back for the chance to win big!